If you have come here to learn how to DIY evergreen garland for Christmas you have come to the right place! I have revamped the original tutorial with a video showing the tricks and techniques to make lovely, fresh evergreen garland for your home. You can watch the video below and scroll down for a list of supplies and detail photos. 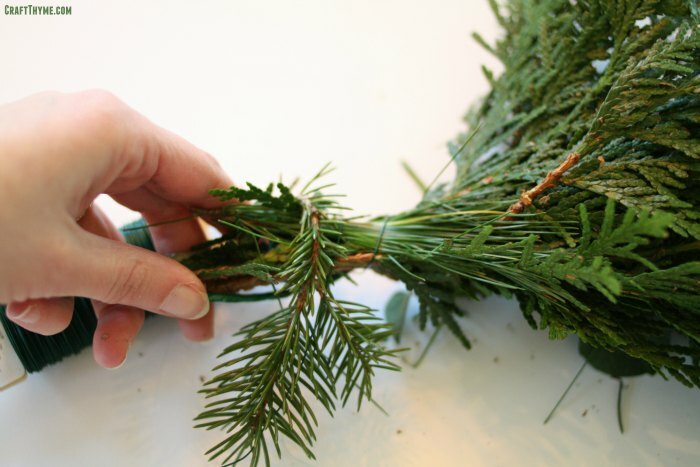 Or read the original How to Make Evergreen Garland or Swags post. Gloves *: Wear the Gloves!!!! 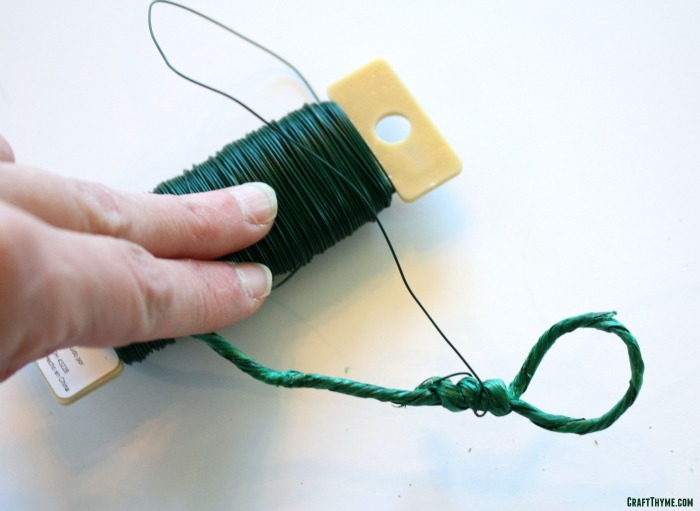 To start the evergreen garland make a loop with the thick wire. This will be useful for hanging your garland later and give you a base to anchor the floral wire. Really, put on your gloves after this part. Otherwise be prepared for scratch, resin covered, hands. While, I may be awful at rapping, I am very good at wrapping. This simple step is all you need to repeat to make a beautiful hand tied garland. Evergreen items are cheap to free. Walk around your back yard. Ivy, pine, boxwood all make interesting additions. Ask you neighbors and make sure to just cut small amounts so it does not even appear that you have been there. Do not be afraid to decorate your garland. Additional branches, beads, and lights can make it look fabulous! Work outdoors if possible. While the video was taken inside due to the wind, you are going to have a lot of pine needles around your house from the construction. Gloves. I am bad about wearing them. Which is why my hands are always cut and rough. Remember if you need a full pictorial tutorial you can get a recap of the video. Just visit my How to Make Evergreen Garland post. Feel like it is too much to make your own garland? 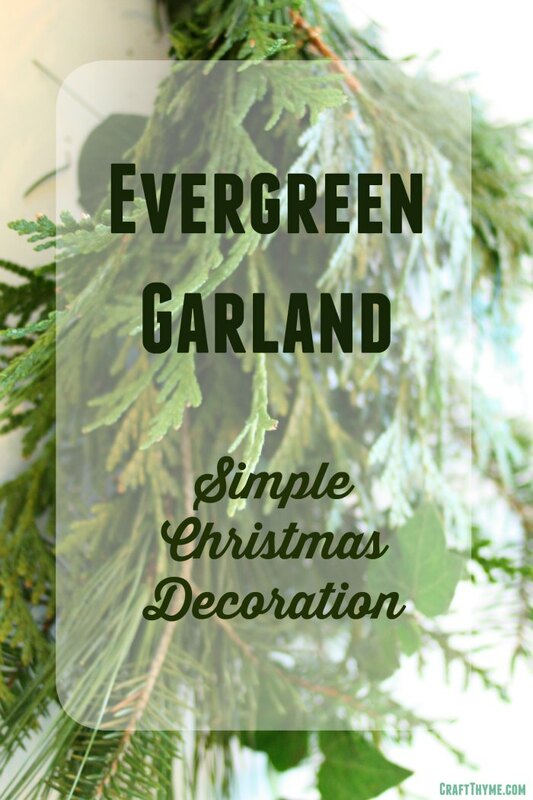 Well then read my tutorial on how to Make Artificial Garland Look Real for tips to cheat the DIY process and come out with beautiful Evergreen Christmas Garland. I would love to do accomplish this, this year – how do I preserve the greens to use indoors? There is not anyway I know of to truly preserve evergreens. I like to think that that the limited life span as decoration is part of their charm. Brianna, as always I love this tip! I’ve always loved evergreen garland and this makes it easier for me to accomplish, I’m going to Pin this for next year. We have an artificial tree and the worst part about decorating is fluffing the tree out each year. I dislike it intensely. I was thinking as I did it this year that I want a real tree next year so I don’t have to do this, then I can pick up extra greens to make the garland! Thanks for walking us through how to accomplish a gorgeous garland!!! Great! I would love to see a picture of your swag when you are done. I have looked all over the internet and I cannot for the life of me find the Evergreen rustic 18 gauge wire. The only ones that I can find are brown. Can you please direct me to the place where you bought your green 18 gauge rustic wire. I would really appreciate it. I am part of a garden club that makes wreaths for the holidays. Our budget for the year comes from them. We ended to workshop today and there were a lot of leftover branches, pine cones and ribbon. I’m really excited to use it, but I need to get the wire first. Please and thank you. I get mine from the floral section in michaels. Or you can use buy it from Amazon*.